If the names Eddie Walker, Evan Olson, Snüzz Uzzell and Millard Powers aren’t as familiar as those of Darren Jessee or Sam Smith, you’ll want to take a look back in the musical history of Ben Folds to his early days bouncing around the North Carolina music scene. 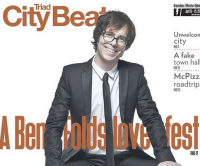 A feature article, A Ben Folds Lovefest, in the Greensboro, N.C. weekly Triad City Beat this week has a great overview of how Ben got into the music business, the friends he involved and met along the way, and some of the crazy gigs they played. Reading Brian Clarey’s feature helps to explain the origin of many of Folds’ iconic songs like Army, where Ben drops out of school and forms a band which he subsequently gets kicked out of. It goes into Ben’s multi-instrumental abilities, with onetime bandmate Evan Olson describing how quickly Ben could learn a new instrument. And Olson’s not surprised at how many times Folds’ musical career has evolved, having realized at the time that Majosha was an “ephemeral project” but that it was time to move on. The article concludes with a wrapup on what Ben’s original bandmates are currently up to. There’s more about Ben Folds Five and the early days in our original Ben Folds Five website, still available using the link in the column to the right.